Is Your Dry Ice Pure Enough for Food? Home » Science Notes Posts » Biochemistry » Food Chemistry » Is Your Dry Ice Pure Enough for Food? You probably know you can drop dry ice in warm water to make fog, but you might not know there are different types of dry ice. Ideally, ‘dry ice’ is just another name for solid carbon dioxide, but it’s like any other chemical in that it may or may not be 100% pure. Some impurities may be harmless while others may be potentially nasty contaminants. You can use pretty much any dry ice to make smoke or fog for a party effect. You want to use food-grade dry ice if you intend to put the dry ice in drinks or are going to use it to freeze foods. 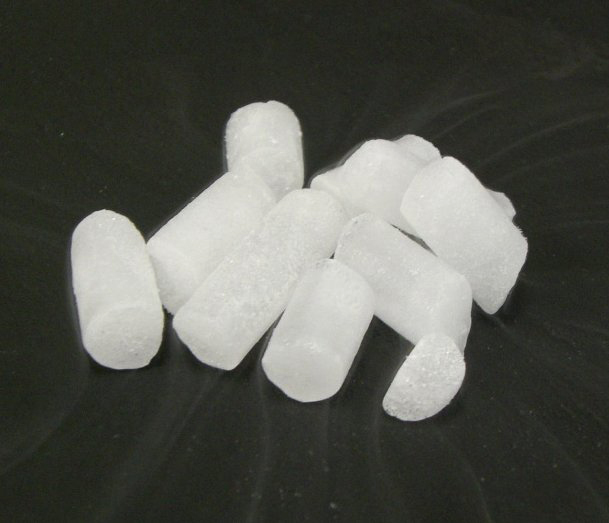 Your supplier should be able to tell you whether your dry ice is food-grade or not. If you add dry ice directly to drinks some of the carbon dioxide will be dissolved in the liquid in much the same way as some carbon dioxide stays in carbonated beverages even after the fizzing has stopped. This will make the drink more acidic than it would be otherwise, which will affect the flavor slightly. If dry ice is added to a pool or hot tub, you’ll want to pay attention to the change in pH because it could impact your water treatment regimen. Dry ice sinks in water, so it’s fairly easy to avoid direct contact if it’s in a drink or if you are in a pool with it. When nearly all of the dry ice has sublimated, then water ice forms around it. This ice containing a dry ice core will float to the top of the liquid. It’s very cold, so you don’t want to drink it or handle it.